Towards the end of the 1920s, a second turning point in the evolution of car marketing came about. General Motors (“GM”) overtook Ford in terms of sales volumes by offering more attractive vehicles. Contrary to Ford’s approach, GM concentrated more on the styles, colours, and external appearance of its vehicles. GM’s marketing strategy was geared at segmentation: “a car for every purse and purpose”. The strategy was based on the class divisions that were coming to shape American society. Economic development favoured social climbing. As the average income increased, more people climbed the “ladder of consumption”, acquired a new status and had more time at their disposal to enjoy a new lifestyle. For the different social classes, GM offered different products at different prices, seeking to attract potential clients from the various segments through different advertisements. When he became President of GM in 1923, Alfred Sloan established a new relationship within management between marketing and engineering, and marketing and production. In just a few words, he rewrote the rules of marketing. He understood the importance of changing consumer expectations. In this sense, he too was a “disruptor”. The motto “A car for every purse and every purpose” not only established the principles of segmentation, but also signalled the abandonment of the rule of considering a product merely in physical terms. 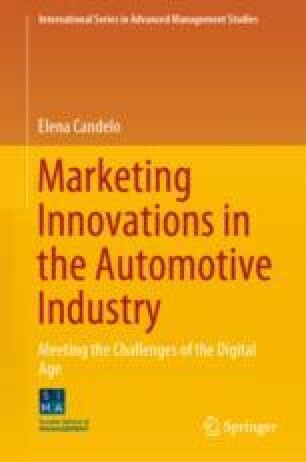 GM devised its products not simply as means of transportation, but as objects, as tools for attracting and eliciting positive perceptions among potential customers.